We have had a very busy couple of months at London Mining Network, and many of our friends have been busy too, as you’ll see below. This mailout includes news of our speaker tour around the Annual General Meeting of BHP in London last month, including the AGM itself and the issues raised by our visitors from Brazil, Chile, Colombia and the USA. These activities cost a lot of money, so if you can donate to help out, we would be grateful – our crowdfunder ends this Friday. We are grateful to all who have contributed so far, and to Het X-Y Actiefonds, IndustriALL, Lush Charity Pot, UCL, LMN member group War on Want and other organisational donors who helped with our costs. We also cover the new report published by War on Want on mining in Latin America. And we welcome new collaboration with friends in Ireland putting pressure on Irish companies linked with the coal mining affecting our friends in Colombia. We also include coverage of the visit of South African activist Nonhle Mbuthuma, a member of the Amadiba Crisis Committee, struggling to protect the Wild Coast of the Eastern Cape from destructive mineral sands mining by Australian company MRC, whose biggest investor has been UK businessman Graham Edwards; and we celebrate a recent victory in the region too. LMN member group The Gaia Foundation has just launched a new report, Wh@t On Earth? !, challenging the tacit acceptance of a modern world dominated by technology, with the variety of negative impacts that it has, including large-scale mining. LMN participated in the recent Thematic Social Forum on Mining, held recently in South Africa. We helped plan the event and intend to play a part on developing the international alliance of people working for mining justice, including mining-affected communities, mining unions, solidarity groups, women’s groups, LGBTI+ groups, faith groups, Indigenous Peoples and NGOs, which the gathering was intended to widen and strengthen. You’ll also find news below about some of the companies that we and our friends here in Britain continue to work on – Acacia Gold, Antofagasta, Glencore and Vedanta – and about the threat posed by deep sea mining. We’ve had to leave lots of mining news out of this particular mailout, but you can find all the day-by-day news that we put out on Twitter either by following us @londonmining or visiting the homepage of our website and scrolling down the tweets in the bottom right hand corner. Do donate to our crowdfunder if you can. Thank you! Justice for Krenak indigenous People! We’ve extended our crowdfunder and have just two days left to raise money to help towards our costs of organising Beyond BHP! Please donate if you can and a massive thank you to everyone who already has! Burning coal is the dirtiest form of energy generation, fueling climate catastrophe, mass extinction, environmental injustice and ecocide. Yet, Banks Group, with support from their friends in the British government, continues to dig it up. Contribute to the crowdfunder to support protesters prosecuted in County Durham. Three years ago, in Brazil, the destruction of the Mariana mining dam, owned by Samarco (a consortium of multinationals composed of the Brazilian mining giant Vale and the Anglo-Australian company BHP Billiton), led to the dumping of dozens of millions of cubic meters of polluted sludge in the Rio Doce River. After a 680 km run in the waters of the river, toxic sludge finally reached the Atlantic Ocean a few days later. Pledge to support the Krenak People. If you live in the UK, please ask your MP to sign EDM 1850 on Lonmin at Marikana. They demonstrated against the “neo-colonial” mining that is wrecking the environment. 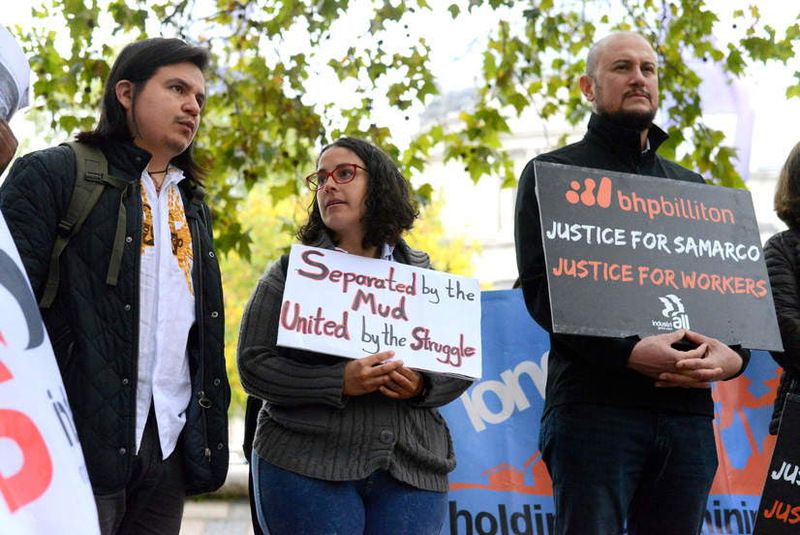 Protestors from three continents gathered outside mining giant BHP’s annual general meeting to demand an end to the company’s environmentally and socially destructive activities. Immediately before the 2018 BHP London AGM, LMN published a summary of five cases where BHP has left behind severe environmental damage – and one case where if it goes ahead with a project, it may do so again. The Campaign to Protect Pont Valley was visited by three special guests from Colombia. We hosted Misael, an indigenous leader, Rosa and activist lawyer, and Aldo, the president of the national coal workers union. We had events in Dipton, Durham Miners Association and Newcastle. For the third anniversary of the Samarco tailings dam disaster, our friends in the Movement of People Affected by Dams in Brazil issued a declaration: From the river to the sea, they will not silence us: 3 years of mud and struggle. Recent coverage by Business and Human Rights Resource Centre of a new lawsuit launched earlier this month. “Death to all these scum”: threats made by far-right paramilitaries promise to “clean” the region of indigenous Wayúu campaigning against mega-mining projects by UK-listed companies in their ancestral lands. On 17 October, while we in London were at the AGM of the world’s largest mining multinational, BHP, our friends from the small farming community of Tabaco in La Guajira, Colombia, undertook an occupation of the land that they were promised in 2008 as the site for the reconstruction of their village, which was violently evicted in 2001 to make way for the expansion of the Cerrejon coal mine, owned by BHP and two other London-listed mining companies, Anglo American and Glencore. Burning coal is the single largest contributor to global climate breakdown. Human rights violations at the sites of fossil fuel extraction are often hidden. A study led by Noel Healy from Salem State University in Massachusetts analyzes the hidden but interconnected injustices that can occur throughout the world’s fossil fuel supply chains. The research project spanned three sites: a power plant in Salem, Massachusetts, recently decommissioned and converted from coal-fired to natural gas; the Cerrejón open-pit coal mine in La Guajira, Colombia, which was the primary coal supplier to the Salem plant for over a decade; and hydraulic fracturing (fracking) sites in Pennsylvania, which now supply natural gas to the power plant in Salem. A new report prepared for the Arizona Mining Reform Coalition to coincide with BHP’s annual general meeting in London, shows serious flaws and deficiencies in the technical design of Rio Tinto and BHP’s proposed Resolution Copper mine. The proposed mine, which would destroy the sacred land of Oak Flat and more than 5,000 additional acres of precious public land, already is known to cause unacceptable and irreparable harm. The report now shows that the design of the proposed mine is unworkable. The vast expansion of mega-mining projects in Latin America is displacing indigenous communities, destroying local ecosystems, and costing lives and livelihoods. In a new report, War on Want exposes the devastating impact of British mining in Latin America, gathering 17 case studies from across the continent to produce a damning indictment of one of the world’s most powerful industries. What happens when a “driverless” train loses its driver? BHP Billiton and Rio Tinto are both proud promoters of techology designed to autonomise, and economise, their mining operations, ultimately making mining the victor in the contemporary battle between human and artificial intelligence. Despite facing repression and deadly violence, Nonhle and her community are at the forefront of a campaign uniting communities across Southern Africa to assert their Right to Say No to unwanted mining and other mega-infrastructure projects. They are also advancing their own alternatives to destructive ‘development’, rooted in the richness of their ecosystems and non-extractive livelihoods. The community will get back its 700 hectares of ocean-facing land, and will be shareholders of, and receive rent for, the land the Wild Coast Sun resort was built on. A South African Constitutional Court ruling has fundamentally changed the power balance between mining companies and communities. The court upheld the Lesethleng community’s land tenure rights, meaning companies will no longer simply be able to evict occupants of the land they want to mine. LMN member group the Gaia Foundation has launched a new report, Wh@t On Earth? !, written by Philippe Sibaud. Challenging the tacit acceptance of a modern world dominated by technology, the report argues that the digital age is disconnecting us from ourselves, each other and our living planet – at a time when re-engaging is more important than ever. The report is being launched ahead of Buy Nothing Day on the 23rd of November – an international day of protest against overconsumption concurrent with Black Friday in North America. This is because our over-identification with digital technologies is fuelled by mindless consumerism. Vedanta up to new tricks? Although the government of Tamil Nadu in India ordered closure of Vedanta’s notorious Tuticorin (Thoothukudi) smelter – in belated response to citizen demands and police shootings earlier this year – the company is now marketing its production. Is the move designed simply to raise much-needed cash? Or does it presage an attempt by Vedanta at forcing the government to reverse its order? In any event, the move will hardly be welcomed by thousands of people, yet to see any compensation for suffering the effects of the plant’s pollution over more than two decades. The Centre has turned down a demand from Goa miners for resumption of the mining activity in the state through an ordinance, a move that could hit the country’s mining output growth. One of the companies mining in Goa is Vedanta. A year ago, Katanga Mining Limited, a subsidiary of Glencore plc, was forced to publish an embarrassing internal audit after its activities were probed by Canada’s Ontario Securities Commission (OSC), which oversees the Toronto Stock Exchange. The audit found “material weaknesses” in financial reporting relating to the company’s activities in the Democratic Republic of the Congo, where Katanga Mining operates one of the richest copper and cobalt mines in the world. Top executives at Barrick Gold and Randgold Resources were warned about human rights abuses at Acacia Mining’s North Mara Gold Mine in Tanzania ahead of the merger between the two companies. Shares in Chilean miner Antofagasta Plc got a boost after the company announced the board of directors had approved a $1.3 billion expansion of its Los Pelambres copper mine in Chile. See the LMN report on Antofagasta as background.